An enchanting blend of rustic charm with the luxury of urban amenities, the Tent City is the largest tent accommodation in India sprawling across an area of 5,00,000 sq. mt. Around 350 luxury swiss cottage tents are set up every year with meticulous precision and refined aesthetics especially for Rann Utsav to ensure maximum comfort for every guest. While each tent is equipped with all essential amenities, you can choose accommodations that allow you to beat the heat with an AC tent and use the heater to warm up on a chilly night. Get comfortable with these four different types of accommodation based on your preferences. Plush interiors, exquisite fabrics, wooden flooring and equipped with an AC & heater, the Premium Tents are designed to pamper your senses after a long day of revelry. Spread across an area of nearly 44 sq. mt., this tent includes a spacious porch, a comfortable double bed, an attached bathroom and a cozy sitting area with a centre table and two chairs to relive the most memorable moments of your stay. Graceful décor, luxurious amenities and spacious rooms sum up the Deluxe AC Swiss Cottage. Spanning across 36 sq. mt. in area, it welcomes you with a front porch and lets you unwind with its well-furnished interiors that include two single beds, a centre table with two chairs,an attached bathroom, and an elegant wooden flooring. 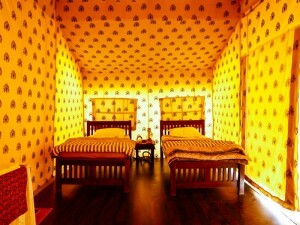 The Deluxe AC Swiss Cottage is a snug retreat to rejuvenate your senses. Cozy and delightfully decorated the non-AC Swiss Cottage is approx. 36 sq. mt. in area. Feel at home with a charming front porch, two single beds, an attached bathroom, a centre table with two chairs and a fan to help you stay cool. Colorful carpets adorn the mati-lipan style flooring in this accommodation. 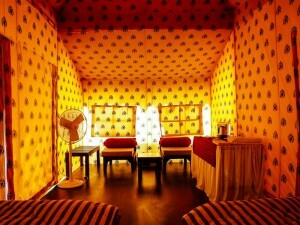 A regal abode, The Darbari Suite offers a whole range of imperial indulgence. Its majestic interiors, elegant furnishings and luxurious amenities, will make your stay at Rann Utsav an absolute royal affair. Spread across 1,600 sq. 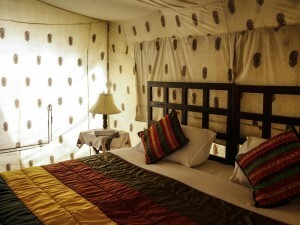 ft. the suite is equipped with an AC, heater, flat screen TV, mini-bar and includes a sit out area for a camp fire, a well-appointed living room furnished with a royal sofa set , two posh master bedrooms, a spacious dressing room, an attached bathroom, a delightful private dining area and much more. 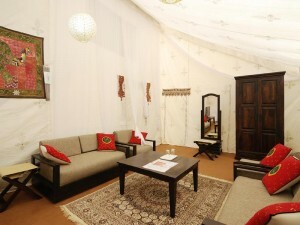 Additionally, also provided are special services such as express check in and exclusive transfers for your convenience.